LANGLEY, British Columbia – It’ll be a battle between two of the best teams in Canada West this weekend as the No. 5 Trinity Western women’s volleyball team hosts the No. 6 Calgary Dinos Friday and Saturday in the Spartans final weekend of the fall semester at the Langley Events Centre. Both teams enter Friday’s contest sitting in a tie for third in Canada West and with plenty of momentum on their respective sides. The Spartans (8-4) are currently riding a five-match winning streak while Dinos (8-4) have won four in a row. TWU won both games last year against Calgary, winning 3-1 and 3-0 on the road. The last time Calgary was in Langley was for the 2012-13 Canada West quarter-finals, when the Spartans won the best-of-three series in two matches, 3-0 and 3-1. Including the playoffs, TWU has won nine straight matches on home court against the Dinos. The last time Calgary won in Langley was on Oct. 31, 2008 in a five-setter at TWU’s old David E. Enarson Gym. 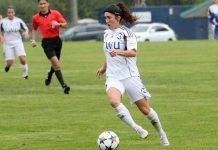 Friday’s game is at 6 p.m. and Saturday’s game is at 5 p.m.
Trinity Western is coming off its best weekend of the year as the Spartans beat then No. 5 ranked Brandon on back-to-back nights. A sweep of Calgary this weekend would send the Spartans into the break in a great position to make a post-Christmas run at top spot in the conference. After winning their first three matches of the season, the Spartans went into a four-match tailspin that saw them fall below .500 and searching for early season answers. Since then, it appears the Spartans have found what they were looking for. Five straight wins, including their first weekend sweep of a ranked opponent this year, has TWU on a roll. This weekend will provide another test to see how they stack up against yet another CIS Top 10 team. If the Spartans can manage to earn a sweep against the Dinos, they’ll set themselves up well for what appears to be a rather manageable spring schedule. While it’s become abundantly clear that no weekend in Canada West is ever easy, four of the Spartans final five weekends are against teams currently sitting amongst the bottom six in the conference. Sophie Carpentier has earned double digit kill totals in 10 of TWU’s 12 matches, but this past weekend she put together her best two-match series of the year. Against the Bobcats, Carpentier had a season-high 20 kills on Saturday and 17 kills on Friday. All told, she collected 42.5 points over the weekend to lead TWU. She is currently fourth in the conference with 3.29 kills/set. After two straight years in which Calgary missed the playoffs, including a 5-17 season last year, the Dinos have turned things around this year and have found their rhythm. After a 3-3 start to the season, Calgary earned a weekend split with No. 1 Alberta and since then the Dinos have rattled off four straight wins. 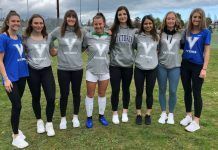 Part of the Dinos success can be attributed to former Spartans outside turned Dinos libero Amber Brown, who joined Calgary for her fifth year of eligibility to pursue an MBA in her home province. However, due to injuries, she’s not expected to play in Langley this weekend. With their split against the top-ranked Pandas, the Dinos put themselves on the national scene and are suddenly right in the mix to make a run at a home playoff date. Following their weekend with Alberta, Calgary earned a pair of convincing sweeps over Regina and Saskatchewan and look to be on an impressive roll. 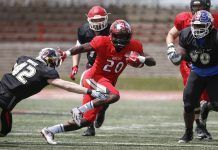 Calgary opened the season with a pair of wins over the defending CIS champion Manitoba Bisons and, other than a setback against Thompson Rivers, the Dinos have only lost to teams ranked in the CIS Top 10. Fifth-year setter Jordhynn Guy has guided the Dinos attack to a conference leading .225 hitting percentage through 12 matches. Individually, Guy is averaging 9.21 assists/set, which has her third in Canada West. Over their last four matches, Guy averaged 9.73 assists/set and helped the Dinos hit .253 as a team. 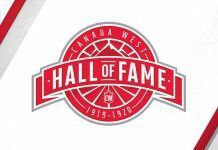 We’re only halfway through the season, but Calgary’s Kate Pexman is well on her way to being a top contender for the Canada West Rookie of the Year award. The first-year left side is leading the Dinos with 2.96 kills/set and 3.5 points/set. Her .254 hitting percentage is also tops amongst Calgary’s outside hitters.